This is a cute book nerd pin badge. 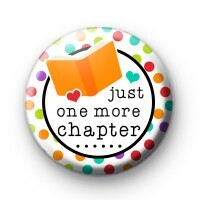 It has the text 'Just One More Chapter' which is what all book addicts and avid readers promise themselves. Our handmade book / reading themed badges are ideal keepsakes for Schools, Libraries and anyone that is obsessed with reading.